Happy birthday to my sister, Carolyn who turned 54 today! I’m back on the low carb wagon again and I feel good about it. I seem to notice results quickly when I stop eating bread, noodles & potatoes. It also helps that I stopped sucking down tons of sugar in cookies and chocolate. It’s been about 3 weeks, and I had gotten to the point where I was really craving a pie 😆 . 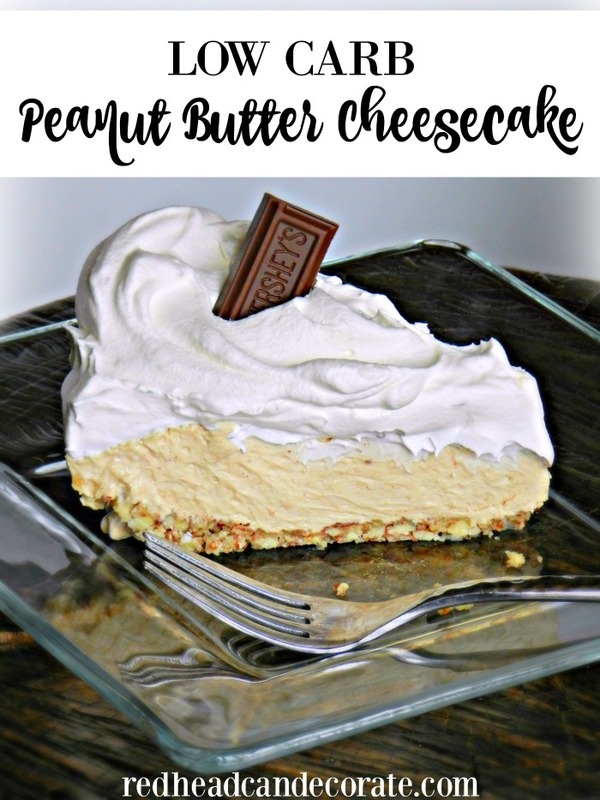 I came across a low carb peanut butter cheesecake pie recipe, but it contained too much fat. Low carb eating is great, but only if you watch that saturated fat intake, too. I went ahead and decreased the fat by altering a few of the ingredients, and it still turned out great. This pie is still very rich, and very satisfying. 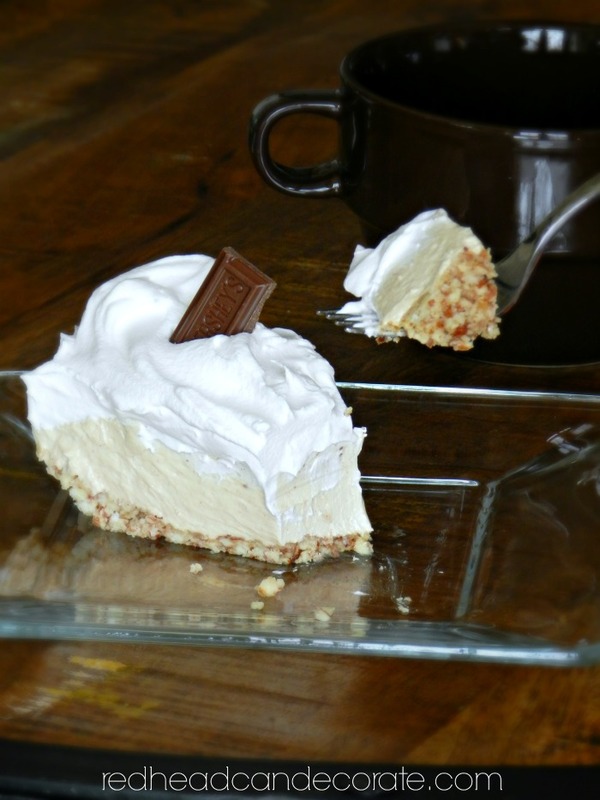 It tastes a lot like a Reeses Peanut Butter Cup even without the chocolate. It’s very simple to make, too. Before I give you the recipe, I should tell you that this is the first time I made a pie crust with almond flour (crushed almonds) and I am in love with it. This is also the first time I have tried Truvia and I was also impressed with that. I do not recommend using sugar substitutes often, but for a treat while you’re trying to lose weight, I say go for it. You are ultimately benefiting your health by losing the weight, so it’s a good thing. If you wish to use regular sugar you can, but it will increase the carbohydrates. Please keep in mind this pie does still contain carbs and saturated fat, but significantly less than typical cheesecakes. It’s meant to be eaten occasionally and in small portions. Don’t forget to check out the rest of my low carb recipes HERE. Spray pie plate with non stick cooking spray. Pour melted butter, Truvia, and almond flour into pie plate and press into bottom. I pressed mine so a little of the crust went up the sides, but not far. Bake for 10 minutes, and allow to cool in fridge. 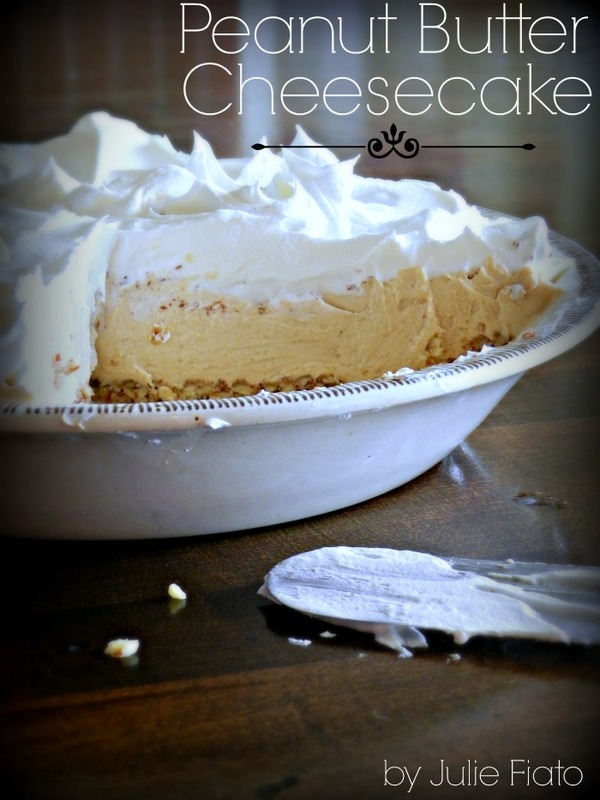 In a large mixing bowl, mix cream cheese, peanut butter, and Truvia until creamy. In a medium bowl, beat (with a mixer if possible) half & half for 3 minutes. Add half & half mixture to peanut butter mixture until very well combined. I used a mixer. Scoop combined mixture into pie crust after it has cooled and spread evenly. Spread cool whip all over the top. OMG, this looks so yummy. I got to give this a try this weekend. Let me know if you do, Ivory. I have been having a tiny sliver every night and it’s just right. Hi Julie! I am needing to make my sister a treat this weekend, when I go back to visit my Mom (sis lives next door, & last week she brought me my favorite brownie 3 different times!). I promised her a very delicious & interesting dessert ~~ Here it is! I can’t wait to try your recipe out on Lucy & her family, & from your pictures that u included, I know they will be quite impressed …. with me… ; ) ….. I will ‘fess up it’s yours, after I please them all! Thank You! Bring hot fudge to drizzle over it, that will really get them! (Just pour in plastic bag and nip corner to use as a drizzle spout).